Healthy mac and cheese with turmeric is the latest in my collection of baby food recipes for toddlers. To be honest, Camille has never had a bowl of macaroni and cheese without broccoli in it. If you start kids out this way, they get used to the ‘green bits’ in most things. Remember when I used to add spinach to her scrambled eggs? But, if you’re not starting there, it’s never too late! I’m constantly trying to improve my Mom game with Camille’s diet. Over the past few months, I’ve health-ified macaroni and cheese to the max. But then, I reigned it back in. 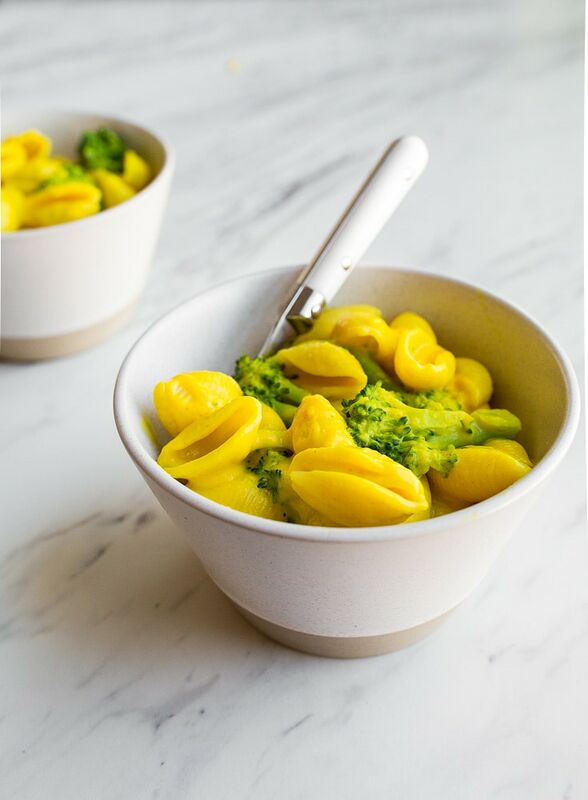 I landed on this version of healthy mac and cheese with a roux-thickened sauce with extra sharp cheddar cheese, a modest amount of turmeric, broccoli, and nutritional yeast. It seems to be my toddler’s favorite (and my favorite, too). I added some onion powder to give it a more ‘adult’ taste, but you can leave it out if you know your kids will detect it. Camille used to munch on raw scallions in the grocery store, but now she won’t even touch caramelized onions. This onion powder is my attempt to get her to come around again to onions. I feel like so much of introducing kids to food is just to try, try again. Frozen broccoli is very welcome here. You can also leave out the nutritional yeast, and bump up the cheese instead. I would love to hear how it goes if you use a non-dairy milk and alternative cheese, too. I left a few mini ramekins of this turmeric macaroni and cheese in the fridge last week before I headed off to San Francisco. I also left a long list of meal ideas for my husband while he took care of Camille. My Mom also pitched in by bringing over a pot roast the night before I came home. Not only did Camille need a dose of spoiling from her grandparents after missing me for 3 days, but I enjoyed a bowl of leftover pot roast with veggies right when I got home from the airport. (Everyone knows leftover pot roast is better than any other kind of pot roast). I came home to one leftover ramekin of this healthy mac and cheese with turmeric, and so I can report back to you that it keeps covered in the fridge for up to 4 days! Just add a small splash of milk when you reheat. 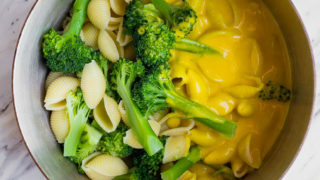 Turmeric macaroni and cheese is a healthier alternative for your toddlers. 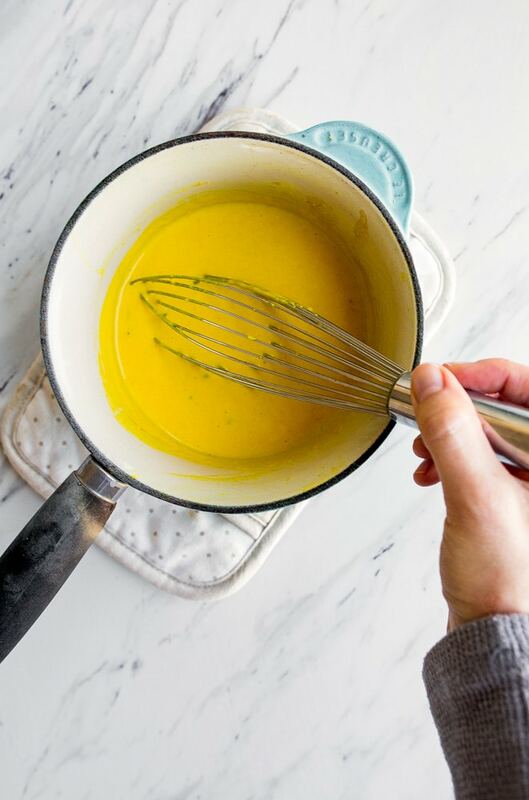 Next, make the turmeric cheese sauce: in a small saucepan, add the butter over medium heat. Let the butter melt, and then whisk in the flour. Cook the flour and butter together for about 30 seconds while constantly whisking. Add the milk to the pan. Bring to a gentle simmer, while stirring occasionally. Check that the roux has properly thickened by dipping the back of a spoon in the mixture. Quickly run your finger along the back of the spoon through the mixture. If your finger leaves a line that doesn't fill in, the milk sauce has properly thickened. If it's too runny, place it back on the heat for a few more minutes. Turn the heat to low. Next, add the cheese, turmeric, and mustard. Whisk until the cheese melts completely. Remove from the heat, and then stir in the nutritional yeast. 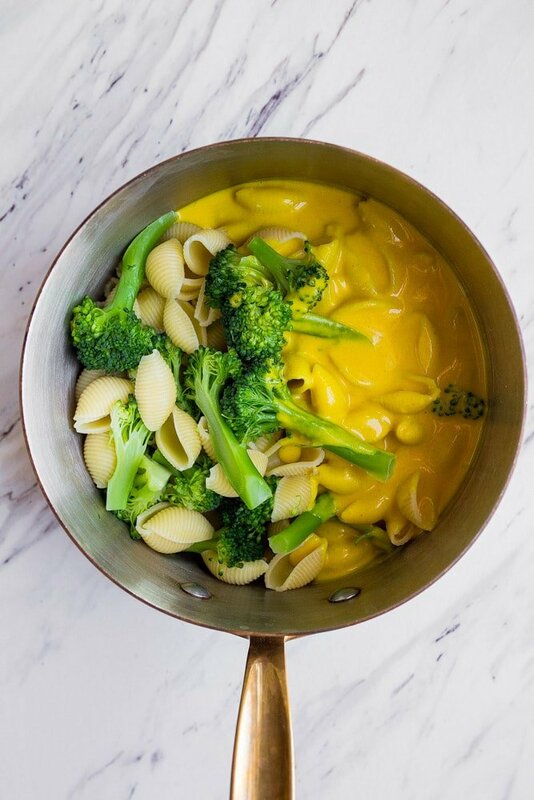 Pour the cheese sauce over the pasta and broccoli, stir, and serve. “If you start kids out this way, they get used to the ‘green bits’ in most things” Until they turn into a “three-nager” and act like anything green is a fate worse than death. I incorporated so many fruits and veggies from the very start and now she flat out refuses most veggies. I have heard this! Mine is almost 3, and she decided she didn’t like carrots yesterday. But last week, she wouldn’t eat dinner unless there were carrots on her plate. UGH. When does it get easy?! i didnt grow up eating mac n cheese so now i will eat all the versions that is out there. This is so good. My 18 month old was eating it by the fistfuls. Thank you for a lunch we can both enjoy! I made this tonight and doubled it because I was feeding two preteen boys. I didn’t tell them about the nutritional yeast in it and didn’t add the turmeric because I only had white cheddar on hand and knew they’d detect it. 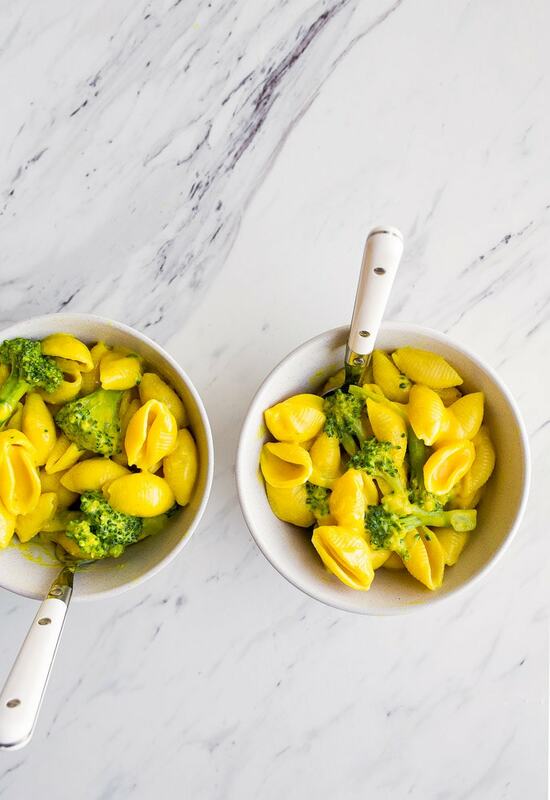 They ate almost an entire pound of pasta and broccoli coated with this delicious sauce! You’re so right about the “try, try again” with feeding toddlers! Thanks for a healthy version of mac & cheese. I’m excited to try this one out! My 15 month old son devoured this tonight…my little family of 3 loves your blog! love that you’ve added turmeric here, and the the onion powder twist to “grow it up”, also good to know how long it lasted in the refrigerator! Delicious and easy recipe! I was so pleased with the turn out :), and so were my babes (2.5yrold & 1 yrold$. I doubled the recipe. I did 1 cup broccoli and 1 cup cauliflower. In addition to that I added another 1 cup 1/2 of steamed puréed cauliflower to the sauce after I added the cheese. I also used unsweetened almond milk. It was delicious! Will definitely be making again !